Angels are creatures that we have become fascinated with for centuries. The word angel comes from the words engel and angele which are old English and Old French terms respectively. Both mean messengers. This perhaps came from the fact that angels act as messengers of God. Remember that time when an angel appeared to Mary and said that she will be having a baby? Angels are peppered all through out the bible. The very first person who called angels by a name was Daniel. There were also mentioned of angels in the Talmud and in other religious texts besides the Christian Bible. Angels have their own hierarchic. The first is the seraphim, which is said to be the caretakers of God’s throne. The word seraphim in itself means “the burning ones” because they are literally always heated up with love and support for the God. The seraphims have six wings. One pair on their faces and the other pairs they use to fly. The next in line is the cherub, which are the guardians of the lights and the stars. These angels are often depicted as small and cuddly but the truth is cherubs have other images. They can be a man, an ox, a lion and lastly an eagle. The face of the ox is however said to be their true form. Next in the tier are the Elders or the Thrones. They are also knows as Erelim or Ophanim, which are angels that were mentioned in the New Testament’s Colossians. They are considered to be the symbols of God’s justice and authority and have also been mentioned in the last chapter in the bible, the Revelation. On another level are the Dominions. In some sectors, they are also called as Hashmallim. They are the ones tasked to regulate the duties of lower angels. 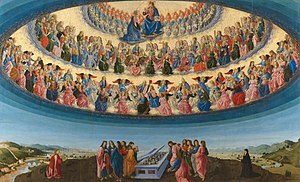 Among all the other angels, they are the only ones with scepters that have orbs on top. They wield these scepters or use their swords. They also have a pair of light feathery wings and are extremely perfect in appearance. In fact, it is the Dominions whose images are often the image from which most angel depictions are base on. The virtues on the other hand are the next in line. Their primary duty is to supervise the actions of nature and heavenly bodies so that disasters can be averted. They ensure that everything in nature are in order. The term virtue is actually derived from the Greek term dunamis which translates directly to Virtue. The next one is the Powers which is the guardians of people’s conscience. They are perhaps the one always being depicted as advisors to people when they are on a crossroad. They are also responsible for distributing the power for humankind. They are also warrior angels who defend the heaven and God. No power have ever fallen from grace but according to legends, Satan was a former power angel who fell to hell. The principalities is another angel rank which is often depicted to be wearing crowns and carrying scepters. They carry out the orders that are given by the other angels in higher ranks as well as to oversee groups of people. They are also said to inspire people to do things for the arts and the Sciences.